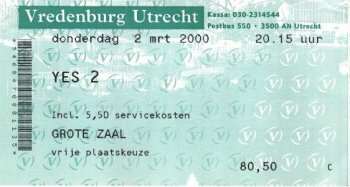 Wanted to share the Yes experience of Utrecht 1 & 2 March 2000 with you. 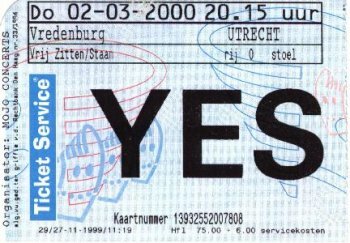 After the disaster of the 1st of march, where I lost my carkeys and therefore couldn't enjoy anything of the concert, the day after was Yes at its best. All guys seemed in a very good mood and Jon was much more joking than the previous night. He, and, we, were in heaven. When enjoying the great Yes tracks like Yours is no Disgrace and And you and I, I always feel like that this is the moment we all waited for, and all past Yesexperiences, like exploring TFTO or GFTO, fly by. What a great moments. Back to the show, the setlist was a good mix of Old and New, with only a few flaws (Face to Face). On the members themselves, Everyone had his share of genius. Highlight of the evening was offcourse Awaken, the Venue was shaking and so was I! To me "And You and I" came as a blownaway track as well, much to my own surprise. One "nice" thing happened during Homeworld - they got lost in the track and everyone, except Jon stopped! But Jon just kept going and the rest followed smoothly. They were alerted by that and were at the tip of concentration the rest of the evening. Secondary condition were also greatly met, no annoying singing or jelling, the drinks were great, the tourbook is great, so overall GREAT show. It can rival with the OYE concerts allthough I rate those a bit higher as they made a great impact on me, than. I picked a place center stage and took a seat this time. Almost with my head in the ceiling. Sound was better. From the beginning Steve was present and the keys were good in the mix. Backing vox improved during the show. Jon made a huge mistake in Homeworld and apologized afterwards to the rest of the band. He also forgot his obligatory "Chris Squire on bass guitar"-introdution after Lightning Strikes. He began introducing the next song when Chris came up to Jon, whispering something like "you forgot me", I guess. Anyway, Jon corrected this. He even introduced Chris after the next song. So, he made up for that mistake. I thought that Awaken even surprised the band itself, giving each other compliments of their respective performances. It was THE most beautiful rendition of that epic I ever heard before. So, that sums it up. 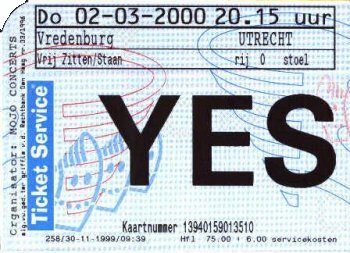 Two Yes nights in Utrecht. I wish everyone who's going to attend the shows in the other countries lots of fun. PS. It's a shame I didn't get a chance to interview the band for my radio show. 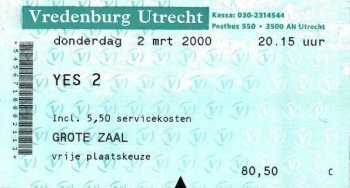 The record company that releases Yes albums in Holland wasn't to willing!